Finally, it’s here! 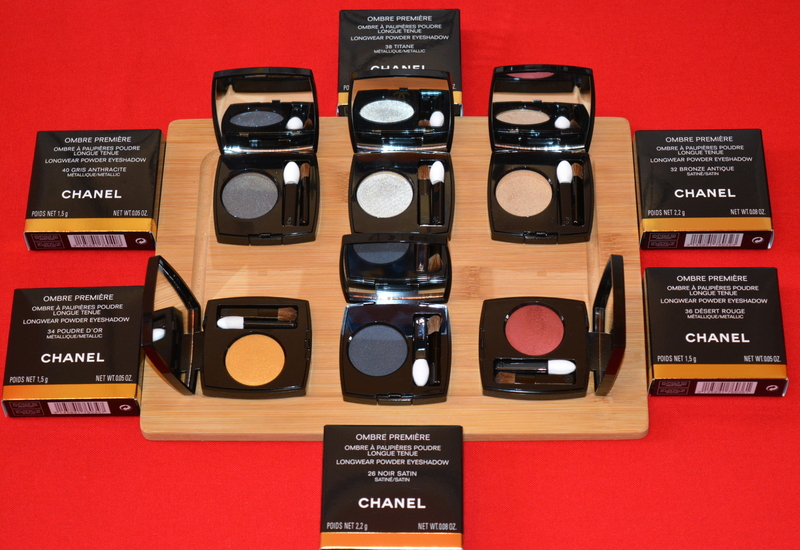 Last Friday (June, 30th), the Ombre Premiere collection from Chanel launched in the UK. Because I couldn’t keep my grubby little mitts off them, I ended up taking two trips to the counter – first on the day of launch, and then, because the collection is so, so good, I had to go back a few days later and get some more things that I kept obsessing over! So, you’ve already figured out what I think – it’s an amazing collection, both in terms of pigments, and textures. If you haven’t seen them yet in person, take a look at some of the things I’ve picked up. These are truly excellent powder eyeshadows. I swatched all of them at the counter, but only picked up six of them – including one limited edition shade, Noir Satin, which is the darkest one. With the exception of maybe a couple of shades in this collection which I thought were a bit more powdery, the rest are exquisitely creamy and smooth. The shimmery shades (like 38 Titane or 34 Poudre d’Or) surprised me a great deal. I expected them the feel a little chunky because of the microglitter, but they don’t! They’re just as smooth as the rest. Truly excellent, and a pleasure to work across the lids. 40 Gris Anthracite: A metallic shade, which is in between deep gray and petrol blue, but with added shimmer. I love this one, and as I was saying above, it is not chunky at all – just smooth and creamy. 38 Titane: Another metallic shade, coming in between silver and a very light, duck-egg sort of green. I thought this one was friendlier and more interesting than a standard silver sheen. 32 Bronze Antique: A different finish for this one – interestingly, ancient bronze comes as a satin shade, rather than a metallic one. This makes it look more relaxed on the lids, but no less interesting. 36 Desert Rouge: This metallic shade was the show-stopper for me and I grabbed it first, before I even looked at anything else too closely. Sure, the color is unconventional, but somehow it still looks amazing on the lids… How do they even do it at Chanel? I must confess, since their 268 Candeur et Experience quad came out, I’ve been a little bit obsessed with reds. By the way, the 268 is completely matte, so not to worry if you have it already. Desert Rouge (which is metallic) and the 268 quad would compliment each other beautifully. 26 Noir Satin: This one is limited edition and labeled as a satin shade, but to me, it feels fairly matte. Either way, you won’t find any hint of shimmer in it. It’s ever so slightly dustier than the others, but not to any alarming degree. In fact, I loved how it layers and blends away so nicely, so I snapped it up without any second thoughts. 34 Poudre d’Or: This is another metallic shade, which in the pan looked a bit scary to me – it seemed like a very yellow shade of gold. However, once I swatched it, I fell in love with it. It seems to be just perfect – in terms of the level of shimmer, creaminess and how well it’s situated on the spectrum between darker bronze-y shades, and actual yellow. A true gold. Here are some swatches for you. Tried my best to show them under various lighting conditions, but I still feel like the photos don’t really do them justice. Visit a counter and take a look for yourself! From left to right, the swatches are: 26 Noir Satin, 36 Desert Rouge, 40 Gris Anthracite, 38 Titane, 32 Bronze Antique, and 34 Poudre d’Or. 806 Terre Brulee: One of the warmest caramel browns I’ve seen. Truly a delight, which I can imagine wearing out to just about anything. It comes close to being a copper shade, but in my opinion, it isn’t – it would need a bit more red pigment for that. So it does stay brownish in tone. 810 Pourpre Profond: This shade is a little more difficult to describe. It’s got hints of plum and red in it, but it is definitely darker than the ‘pure-red’ pigment in Desert Rouge. Having said that, they are designed to be layered together, if you feel like doing that. I should add that, compared to the previous Illusion d’Ombre cream eyeshadows from Chanel, the formula for these has improved significantly. The older ones were spongy or gummy, and I felt like it took a lot of effort to pick up and then disperse the pigment on the lids. With these, no such issues. They’re lovely, creamy and easy to work with. Now, last word on the two, dual-tip retractable brushes: the contouring brush, and the eyeshadow brush. They are both super convenient and great in terms of fiber softness and density. I assume they are made of goat hair (I can’t see this specified anywhere, though). The bushy, blender end is particularly good, and I can totally see both of these coming along with me on my vacation, instead of a bulky eye brush case. One thing I will mention is that, depending on which end of the brush is concerned, sometimes it can be easier or harder to remove the cap. It seems to vary by brush, and brush end. But I don’t consider this a fault, really. The job they are meant to do, they do perfectly well.